AWA peeks out from the Silver Screen at Florence's cinema festival by and about women. AWA peeks out from the Silver Screen at Florence's cinema festival by and about women. What does a 'day in the life' of AWA look like… on camera? Napoli-raised, Milan-educated cinema director Giuseppe Carrerri followed AWA's footsteps on film while creating Episode One of an 8-part docu-film series 'Noi Siamo Cultura', produced by 'laeffe-tv di Feltrinelli' (Sky, channel 139). The show's purpose is to capture the ins and outs of the foundation's Tuscan quest to salvage lost works by women artists. Its cinema premiere in Florence is scheduled for November 8, 2017, as part of the inaugural festivities of the 39th edition of Florence's 'Festival Internazionale di Cinema e Donne'. 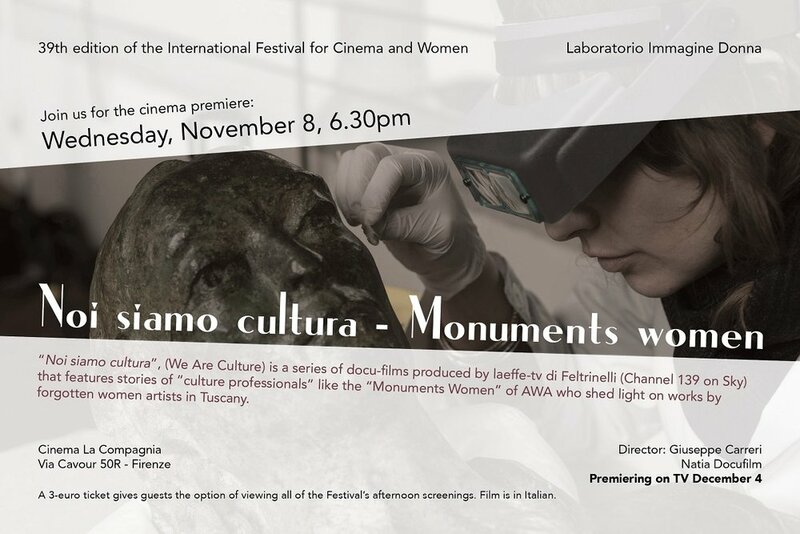 Special on-screen appearances by Stefano Casciu, Director of the Tuscan Regional Museum Circuit and Cristina Gnoni, director of the Last Supper Museum of Andrea del Sarto and Medici Villa Cerreto Giudi. Its small-screen debut? Tune in to the tube on Sky at 8.40pm on December 4, 2017 (channel 139).